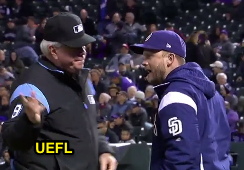 2B Umpire Brian Gorman ejected Padres Manager Andy Green (Replay Review decision that upheld 3B Umpire Dan Iassogna's HR [no fan interference] call; QOCY) in the bottom of the 6th inning of the Padres-Rockies game. With one out and one on (R1), Rockies batter Carlos Gonzalez hit a 1-1 changeup from Padres pitcher Jordan Lyles on a fly ball to left center field, whereupon Padres LF Cory Spangenberg attempted to catch the baseball, ruled a home run by 3B Umpire Iassogna and affirmed via Crew Chief Review initiated by 2B Umpire Gorman. Replays indicate the descending fly ball appeared to enter Spangenberg's glove, but subsequently bounced over the wall as Spangenberg's glove made contact first with a spectator whose hands were atop, but not definitively beyond the horizontally flat portion of the outfield wall, and then the wall itself, the call was correct. * At the time of the ejection, the Padres were leading, 7-6. The Padres ultimately won the contest, 7-6. This is Brian Gorman (9)'s first ejection of 2018. Brian Gorman now has 4 points in the UEFL Standings (0 Prev + 2 MLB + 2 Correct Call = 4). *The definition of spectator interference was revised for the 2018 season as the result of a 2016 incident. Related Post: MLB Changes Rules for Retired Runner, Fan Interference (3/25/18). "Spectator interference occurs when a spectator (or an object thrown by the spectator) hinders a player’s attempt to make a play on a live ball, by going onto the playing field, or reaching out of the stands and over the playing field." 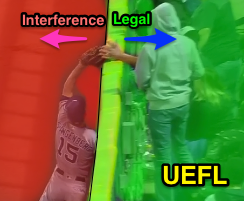 *Because the fan's hands were positioned on the out-of-play side of the plane separating the playing field from the spectator area at the time of contact with Spangenberg, the "reaching out of the stands and over the playing field" criterion is not satisfied, and this cannot be spectator interference, even though contact was made between fan and glove. The fielder reaches across the plane at his own peril. In other words, the fan owns the flat part of the wall, while the fielder owns the vertical space on the playing field side of the plane at which the warning track meets the base of the fence. The fan may legally go to, but not through, the plane. Related Post: Boundary Call - Spectator Interference vs Out of Play (5/17/17). This is the 11th ejection of the 2018 MLB regular season. This is the 6th Manager ejection of 2018. This is San Diego's 1st ejection of 2018, 2nd in the NL West (ARI 2; SD 1; COL, LAD, SF 0). This is Andy Green's first ejection since August 6, 2017 (Tripp Gibson; QOC = N [Interference]). This is Brian Gorman's first ejection since May 29, 2017 (Bryce Harper; QOC = U [Fighting]).